Social influence can happen anywhere: at work, at school, at social clubs, with friends, and especially at home. 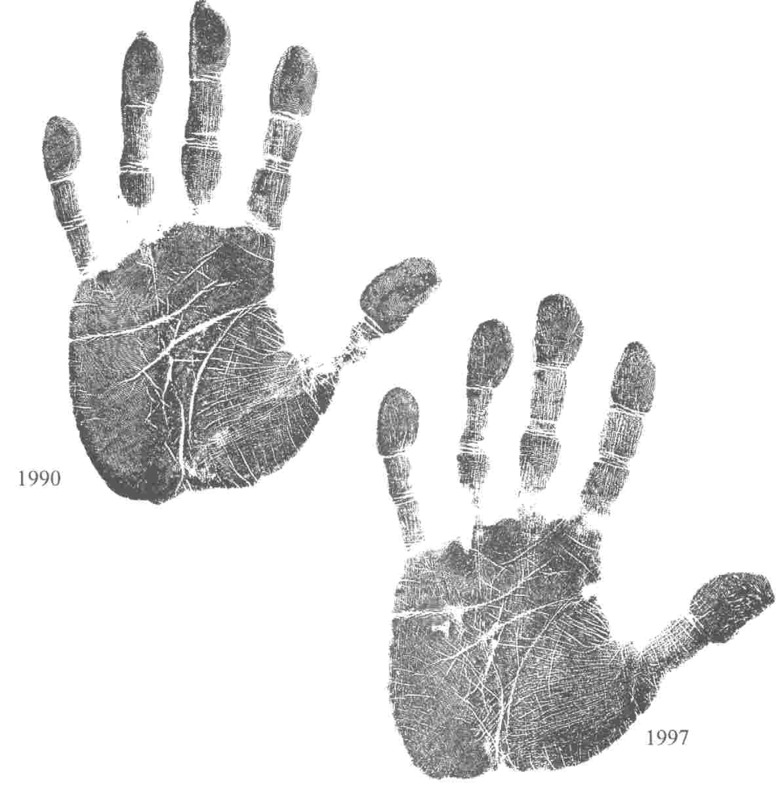 One of my favourite palmistry activities is a comparison of two handprints of the same person, but taken at different times, in order to see the changes that have occurred during the period. While the person may choose to change, very often social influence is the greatest enabler of change. First, let's look at the changes that have happened between those two prints. The first obvious change between these two prints is the thickness of the major lines (i.e., the three most obvious lines of the hands). In 1990, they are much thicker than in 1997. To understand this concept, think of using a big, thick marker to write a message on a small page. The message will be very visible, but not very subtle, and it cannot be very detailed. This is the difference between thick lines and thin lines. In 1990, the person was more blunt. In 1997, he was more refined, deeper, more subtle. Some lines have increased in length. For instance the heart line, which is the curved, horizontal major line closest to the base of the fingers. The heart line stands for the way we love. The longer, the better. The fact that the line has grown in length shows that in 1997, this person was able to express more kindness, more compassion, more love than in 1990. Many lines have appeared everywhere. Look at the vertical lines just under the middle finger. Even though it is better to have one strong vertical line there, any vertical line on this part of the hand is a good sign. It is called the "love of truth line". I also like to call it the self-improvement line, or the line of spirituality. It is a line that makes you want to do better for yourself, to understand the meaning of life, and not be satisfied with superficial things. In the case of the man on the first print, he was very religious, very Catholic, and he went to church every Sunday. But he was doing it out of habit, in a mechanical way. At the time of the second print, he was no longer going to church on a regular basis... but he was applying Christian principles of love and understanding in his everyday life! Also look at the lines going from the bottom centre of the hand towards the little finger. They are called Mercury lines and stand for self-expression. They are used to take whatever you have or feel deep down inside and to share it with the world. Do you see how these lines have grown? Without forming one perfect, strong, solid line, they are still indicating how expressive the person has become. So, what has happened to this person between 1990 and 1997 to produce so many changes? It is a question of social influence, especially spouse influence. This man was married for 35 years to a woman who was unfortunately very negative. All his energy was used to deal with her and to survive. So he kept a lot of his deep feelings and aspirations frozen inside. Between 1990 and 1997, he finally left his wife to live with another woman. Being a "good" Catholic, this was a very hard decision for him. However, the second woman was the opposite of the first one. She loved him the way he was and encouraged him to do what he wanted to do, and to be what he wanted to be. For instance, he had always wanted to play the clarinet. At age 60, he started to take music lessons and actually learned to play the clarinet. He was his teacher's oldest student, but probably the most committed too. During the period between 1990 and 1997, he was finally able to live, instead of just survive. Just like a withered flower that is finally receiving water, he started to bloom, and this is what his hands show. The social influence he received from his two spouses is reflected directly in both hand prints. The great Indian sage Paramahansa Yogananda once said: "It is difficult to be near a fragrant rose or an ill-odored skunk without being affected by it. So it is better to associate only with human roses." These two prints illustrate perfectly this concept. The 1990 print shows the influence of a skunk, and the later one, the influence of a rose! What social influence are you receiving?